We’ve updated how you can arrange the fields in your catalog. What was formerly a collection of drop-down menus has been converted to a drag and drop method. Questions or comments? Tell us all about it on Talk. Test it out and update your catalog styles here! You’ll still have up to five customizable display styles, A-E as pictured, with a maximum of 14 fields in each style. Now, instead of having to adjust five or six drop-down menus in order to add a field to the middle of a style, or completely rearrange the order in which the fields appear, all you have to do is drag and drop! You can drag fields over to a style from the collapsible menu on the right side of the page. 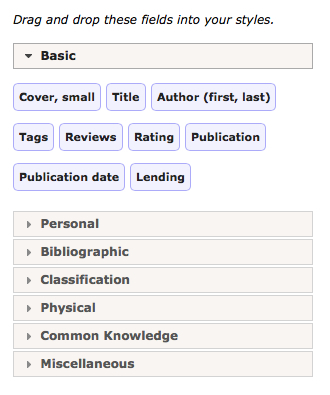 This menu categorizes various fields according to type/function: “Physical” contains all the options for dimensions of the book, “Classification” features call numbers, Lexile measures, and so on. You can even drag fields from one display style into another, although doing so will remove that field from the original style. You can reach your Display Style Settings from either the handy little “Settings” button at the top of Your Books, or by clicking the “Settings” that appears in the upper-right corner, just below the site search bar, when you’re signed in and on the LibraryThing home page, or your profile. Go see it in action and come tell us what you think on Talk! I can’t seem to get the changes to save. I drag and drop as instructed and then hit save changes but then it processes and sends me to the homepage. After I go back to the my books tab, the changes I made are not reflected. I cannot get the display options to save – I am hitting the “Save Changes” button all the way on the bottom of the screen, but it still doesn’t save. Sorry to hear you’re having trouble. Everything looks okay on our end. Can you please email me at info@librarything.com with some more details? I’ll be happy to help you from there. Useful info to have would be what browser/operating system you’re using, and your LibraryThing username. What fields are you moving around and on which display style? Do you get an error message of any kind? Stephanie, it took me a bit to find it – after losing my changes repeatedly – but there is a ‘save changes’ button below the ‘Default style for visitors’ and ‘Books per page’ sections. Also took me a while to find all the choices on the right side of the screen. Altogether much easier than the drop-down menus. Is it possible to customize the A-E style button labels? They are fairly meaningless if you have setup custom displays. I’m not sure what you mean re: customizing the buttons themselves. This post is about how you can customize the styles those buttons correspond to, but there is no way to rename/reorder those buttons. Feel free to email me (loranne@librarything.com) if you have any further questions!